International Macroeconomics provides students with an analytically rigorous introduction to the impact of globalization on macroeconomics. Peter J. Montiel is the Farleigh S. Dickinson ’41 Professor of Economics at Williams College, and received his PhD from the Massachusetts Institute of Technology. He has served as a Senior Policy Advisor at the International Monetary Fund as well as Chief of the Macroeconomics and Growth Division of the Policy Research Department of the World Bank, and has provided expert counsel to a variety of regional development banks and central banks. He is the author of several books, including Development Macroeconomics, 3rd edition (with Richard Agenor, 2008) and Macroeconomics in Emerging Markets (2nd edition forthcoming), and numerous articles on international macroeconomics. Includes 20 optional econometric studiesand over 65 boxed examples and cases. 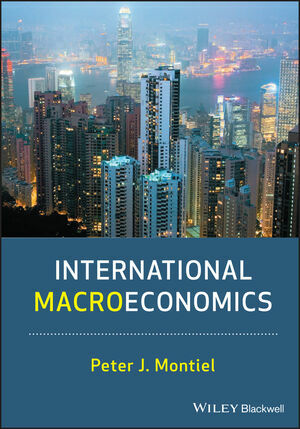 Provides a uniquely unified, single model approach to international macroeconomics and then focuses this model on historic cases, institutions, and specific countries. Provides a strong policy orientation by an author who worked for many years at the IMF. Much more emphasis is given to small country exchange rate problems. Is supported by a website with extensive solutions for the problem sets, image gallery, and annual summer updates on the current financial crisis, including a 20-page update.